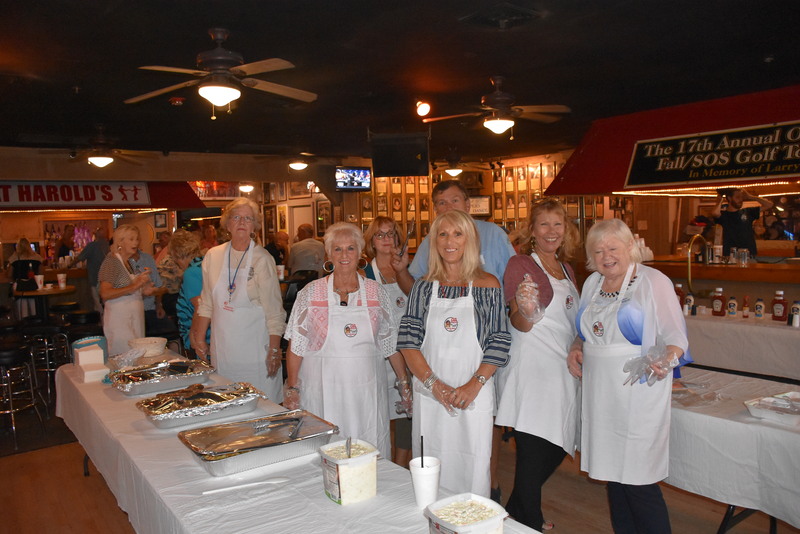 The OD Shag Club held its annual Fish Fry on June 16th at Fat Harold’s Beach Club. The club was decorated by Gail Roberson and Lori Setzer’s crew as Fishin’ Hole and there was also an extra one designed for “surprises” or “bonkers” for those members who were willing to “Go Fishing”. Some of the “surprises” were a Fish Dinner donated by OD Arcade, Hats and t-­‐shirts by RiptideRadio andOD Shag Club Merchandise. Unfortunately for some of the members, there were some “bonkers”, which included a bra (not your size Jerry Harrell), some empty beer cans for Nancy Tisdale, and even a scary but off head for Mike Hardee. Mike and Judy seemed to enjoy having an “extra head” at their table.LOL! Donnie and Wendy Schultz and their dedicated crew (sorry if I leave anyone out) of John Harris, Kevin and Susan Harrell, Terry and Kathy McCoy and many others prepared some wonderful fried fish, homemade hushpuppies (best I have ever had), slaw, beans and a wonderful variety ofdesserts. Thanks to the many people who helped serve and get us all fed. Sandy Cummings was dedicated to help pass around the bucket for our local Jr. Shaggers and over $200 was raised for them. Tickets were pulled for Name Tag, Logo and of course 50/50 which Cathy Jamiolkowski and BillyPowell did an excellent job at selling. Many thanks to Jim Livingston for helping to take photos, as Lou Martino was a little “under the weather”. Great job Jim! Jimmy Buffkin kept the floor full and even managed to play a few appropriate tunes while the members did their fishing…such as “Gone Fishin”. A “snowball” was created as members fishing were asked to “go fish” for a partner to dance with and soon the floor was full with lots of members and new members were dancing. What A Great Event! 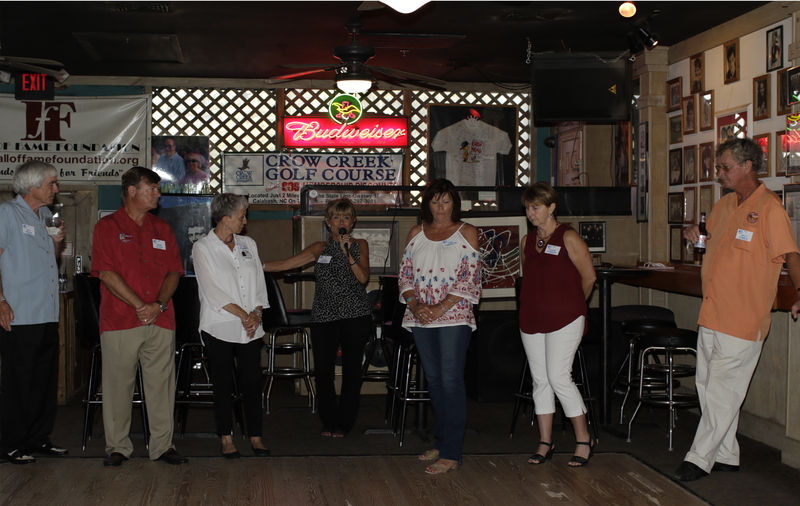 On June 1st, the OD Shag Club Board of Directors hosted a New Member Reception in the backroom at Fat Harold’s to welcome our new members for 2018. In attendance were 8 Board members, 5 Past Presidents, 13 Committees were represented, along with 29 new members. Fun was had by all with games and door prizes. Snacks were donated by Bi-Lo Food Store and served by Wendy Schultz and her food committee volunteers. Thank you, Wendy. Also, a big thank you to Karen Young and Nancy Sook for their assistance with checking in the members as they arrived and to John and Pat Harris for stepping in a taking pictures of our new members for the OD Shag Club Year Book. President Linda Campbell welcomed all in attendance and introduced the 2018 Board of Directors and Committee Chairs. Each one had an opportunity to identify their position with the club and committee chairs had a chance to explain the responsibilities of their committee and encouraged each new member to get involved. If you are attending a Shag Club function and see a new face in the crowd, stop and introduce yourself. It only takes a moment to make someone smile by just saying Hello!